Born to an Irish-American family in the Washington D. C. area in 1913, Philip M. Hannan would go on to travel the world in service to his country and God. Following studies stateside, Hannan traveled to Rome where he continued seminary studies at the North American College from 1936 to 1939, a firsthand witness to the rise of fascism in Europe. He traveled extensively throughout Europe after completing his studies, and spent much of that time in Germany. His experiences in Europe where war clouds were gathering inspired him to join the military. 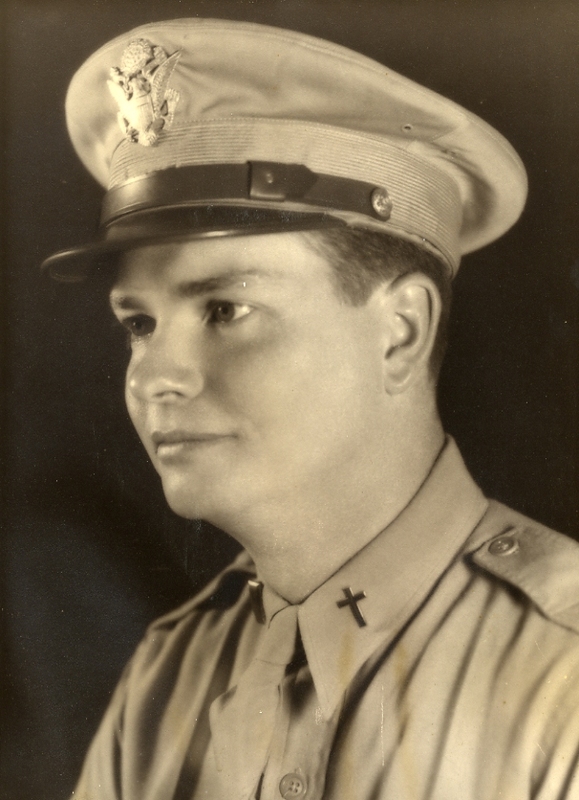 In 1942, Hannan enlisted in the U.S. Army, becoming a chaplain. Initially sent to Florida to minister to Army Air Force recruits, Hannan sought to be sent to the front lines where he was the most needed and could do the most good. Eventually, after multiple transfer requests, Hannan served with the men of the 505th Parachute Infantry Regiment, 82nd “All American” Airborne Division during the Battle of the Bulge in the Ardennes Forest. Chaplain Hannan immediately went into action tending to wounded men, Americans and Germans alike. He spoke in awe of his fellow officers: “They were absolutely admirable…It didn’t matter to them if [the wounded] were German or American; if they were alive they would bring them into the hospital.” He felt a very different type of awe when weeks later his unit entered a concentration camp near Wöbbelin, Germany, an experience he would never forget. After the war, Hannan played a major role in preserving the priceless art and relics in the historic Cologne Cathedral, which had been badly damaged by bombs and street fighting. Through negotiations with the German Archbishop of Cologne, Chaplain Hannan was made temporary protector and pastor of the ancient Cologne Cathedral in order to both preserve the artwork and minister to the troops of the 505th PIR. Archbishop Hannan remained a revered member of the Cologne Cathedral for the rest of his life. After the war, Hannan returned to the United States and served the Catholic community as in the Baltimore-Washington Archdiocese. It was in this capacity that Hannan become well-acquainted with the Kennedy family, and would later give the homily at President Kennedy’s Requiem Mass in 1963. He remained in Baltimore for two more years, when he was called to New Orleans to help with recovery efforts from the devastation of Hurricane Betsy. He was named Archbishop of the Diocese of New Orleans on September 29, 1965 and remained in that post until December 6, 1988. Archbishop Hannan passed away on September 29, 2011, leaving behind a legacy of hope, love and generosity. Click on photo to watch an interview with Chaplain Philip M. Hannan of the 505 Parachute Infantry Regiment, 82nd Airborne Division, from 2010. Text and photo from the website of the National WWII Museum in New Orleans . Video embedded from nola.com, The Times-Picayune.